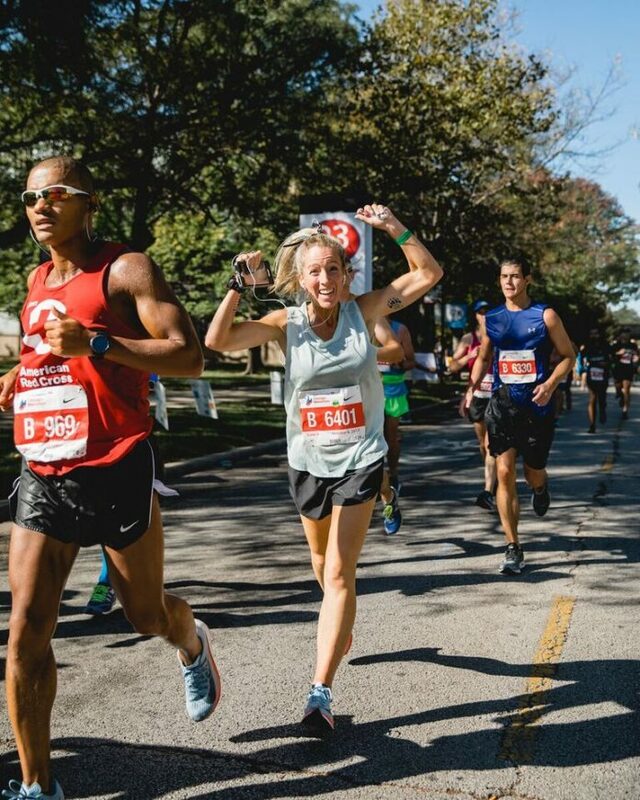 In Training With Nike, Part 1, Chicago Athlete Ambassador Mandi Florip discussed her in-depth training with Nike for the Bank of America Chicago Marathon. 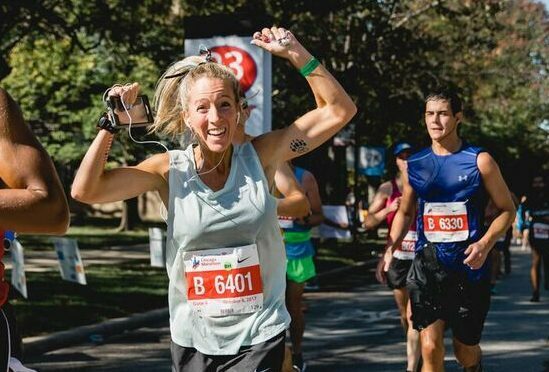 In this segment, Florip shares her race day experience after going through Nike Marathon Training, and how the Nike Breaking2 shoe helped her get a BQ. Like a kid on Christmas morning, I had a very difficult time sleeping the night before the marathon. A mixture of nerves and excitement combined with my intense fear that the six alarms I had set would not go off, kept me up most of the night. Giving up to the idea of sleep, I rose around 5 AM, dressed and went out for a short warm-up. The second I walked out the door and entered the streets of Chicago, there was an indescribable sense of excitement. Although it was dark, the downtown area resembled a business workday. People were everywhere. There were bibbed runners with the same look of nervous excitement as me, spectators reserving a spot early, volunteers setting up water tables and countless law-enforcement professionals. I met my group in the Blackstone Hotel lobby where we each shared stories of sleep deprivation and excitement for the morning. Outside of the hotel we could hear a computerized voice announcing that only marathon runners were allowed near the start/finish line until later in the morning. We grabbed our waters, exited the hotel and crossed into Grant Park. Nike generously provided tickets for our group to enjoy the Balbo Hospitality tent, where we had a chance to sit down and eat breakfast. I realized I was too excited to eat when I left that morning so I grabbed a banana. A great benefit of being in the tent meant I could use the porta potty’s early and avoid the long lines near the corrals. This was when my nerves really started to peak and it hit me that this was the moment I had been training so hard for; this was the moment I had spent countless hour’s strength training and performing tempo and speed race workouts to get to. Within minutes, I knew I would be crossing the start line and embarking on a journey I had been waiting for. 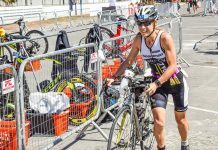 During my training, Coach Robyn LaLonde addressed my two fears: weather and crowds. It turned out she was correct that the weather was ideal, the heat stayed manageable and the winds remained low. All Chicagoans know that this is not something we can take for granted! Although I knew I would not be able to control the thousands of runners that would be alongside me, I let Robin know that I was fearful about passing, being passed and how that would affect my overall time. 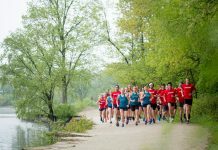 “I know you are generally a solitary runner, but enjoy the people,” LaLonde advised. “Compliment someone’s form. Share the lead against a strong headwind. Just enjoy.” This great advice fueled me through the first five miles when the course was pretty packed. And boy did I have fuel! Immediately after crossing the start line, the cheering crowd, city streets and air of excitement pushed my adrenaline to crazy heights. I flew through the first half of the marathon at lightning pace. I passed the 13.1 mile marker with my average half marathon race pace, right around 1:35. In those first 13 miles, I saw my husband and children, my friend and her daughter and my Nike cheer team. I felt great and I didn’t realize that I was pacing faster than I should have been. Right around mile 14, I felt fear grip me as fatigue ran through my body. I knew I had come out too fast and was fearful I had just sabotaged my BQ goal. As I was running along in my own world of thoughts, Coach Emily Hutchins appeared, jogging along side of me. “Hey girl,” she smiled at me, “how are you doing?” I quickly told her that I had come out too fast and was feeling fatigued. She told me it wasn’t a problem and to just pull back for a few miles. “You’re doing great. Pull back a little and you’ll be fine.” This pep talk was exactly what I needed. Between miles 15 and 20 I pulled back, keeping an eye on my pace card to ensure I was still within the 3:30 mark. At mile 20, I had my confidence and strength back and was ready to rock the last 10 K. Not only was I able to get my stride back, I was able to enjoy the course. The countless spectators, volunteers and racers were full of smiles, encouragement and cheers. My gear felt airy, my Nike Zoom Vaporfly 4%, aka Breaking2, shoes were literally bouncing off the pavement, my legs felt strong and my hydration felt balanced. As I crossed the finish line with a 3:24 time, I could hardly believe it. The 14 weeks of strength training, tempo and speed runs, combined with the technologically advanced Nike gear and shoe wear had an incredible impact on my time. 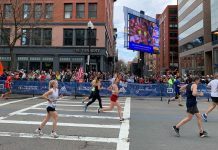 In just 14 weeks, I dropped 16 minutes and 36 seconds off my marathon time, leaving me with a cushioned Boston Qualifying time and a massive sense of accomplishment. I have to admit that I’ve been too excited to sleep the last few nights. Not only did I finish with a time lower than I had anticipated, but I enjoyed every moment of the Marathon experience, from my first day of training to the finish line. There is nothing like the Chicago Marathon. The crowds, neighborhoods, sounds and even the smells make you fall in love with Chicago running. As I look forward to Chicago in 2018 and Boston in 2019, I know my plan will include Nike Coach’s Robyn LaLonde and Emily Hutchins, tempo and speed race work, strength training and Nike running gear and shoes. That combo shaved 16 minutes off my last marathon finish, so I’m not changing a thing!